Atomic Radiation is a subject which interests the minds of every thinking man and woman of this world. In this book we have the sane and sober views of a Medical Doctor on the physical facts and consequences of the actual atomic blast and the diseases resulting from it. L. Ron Hubbard, one of America’s first nuclear physicists, famed author and explorer, has comprehensively analysed these facts and related them to human livingness, governments and the security of the world. These facts when presented at the Congress on Nuclear Radiation and Health at the Royal Empire Society Hall, London, so impressed Parliamentary figures that they requested immediate transcription of these lectures. Here they are presented to the reader in book form. 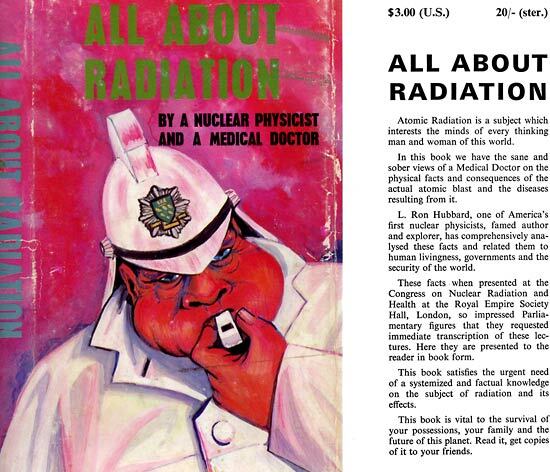 This book satisfies the urgent need of a systemized and factual knowledge on the subject of radiation and its effects.